Home » Pre-Sales Questions » Can I use your WordPress themes on WordPress.com? Can I use your WordPress themes on WordPress.com? Most of our WordPress themes are available for self-hosted WordPress websites. That means you need a hosting provider which supports WordPress or your own server with WordPress installed to use our WordPress themes. You can simply upload and install your theme through the WordPress dashboard, proceed with the theme setup and start publishing awesome content. WordPress.com is a hosting provider that offers free WordPress hosting with a limited selection of WordPress themes. That means you can’t install most of the premium WordPress themes that are available on the market because the themes on WordPress.com are optimized to work with the special restrictions and requirements of WordPress.com. In general you also can’t install WordPress plugins on WordPress.com, as there is already some built-in functionality available. Here you can learn more about the difference between WordPress.com and a self-hosted WordPress website: WordPress.com & WordPress.org. As mentioned before, WordPress themes on WordPress.com need to meet some requirements to work properly with the special hosting environment on WordPress.com. Submitted themes are also reviewed by the WordPress.com Theme Team to ensure a unique selection of themes. That’s why we can’t offer all our WordPress themes for use on WordPress.com. At the moment there is a modified version of our popular MH Magazine WordPress theme available on WordPress.com. Update – June 2017: We’ve decided to retire the theme on WordPress.com. If your site is hosted on WordPress.com and in case you want to use the MH Magazine theme, you can purchase this version. It’s possible now to upload custom themes to WordPress.com if you’ve subscribed to their Business plan. Is it possible to use WordPress.com themes on a self-hosted website? 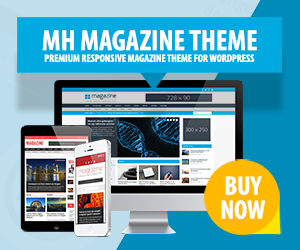 If you have purchased the MH Magazine WordPress theme on WordPress.com, you can only use the theme on WordPress.com and not on self-hosted WordPress websites. That means if you want to transfer your site from WordPress.com to another hosting provider, you’ll need to purchase the version of MH Magazine for self-hosted websites, because it is also not possible to download themes from WordPress.com. It’s the same in case you want to transfer your site from a self-hosted WordPress installation to WordPress.com. In that case you’ll need to purchase the theme on WordPress.com, because it’s also not possible to upload themes to WordPress.com that you have previously purchased. Uploading and installing WordPress themes is only possible on self-hosted WordPress sites.